Choice Organic Teas premium-original line offers a complete selection of superior tasting teas with an environmental conscience. Working closely with international growers, we select only the finest tasting certified organic ingredients to create teas and infusions known for their outstanding character and clarity of flavor. Each tea bag is made from entirely unbleached natural fibers and individually wrapped in a paper envelope. Fill the kettle with freshly drawn, cold water from the purest source available. Bring water to a boil. Pour over one tea bag per cup, allowing 4-5 minutes for the herbal essences to infuse into your cup. Feel free to sweeten as desired. For a refreshing, organic iced tea, brew double strength before serving over ice. Try adding organic apple juice to naturally sweeten. 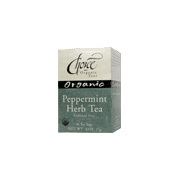 Organic Peppermint Herb Tea is shipped in a discrete, unmarked package. Orders are processed immediately and usually take about 3 to 5 working days to be received. We do ask that you try it for 2 to 3 weeks to feel the full effects. Any information received is used only for order processing and shipping purposes. Your information, such as e-mail address, will never be disclosed to a third party.